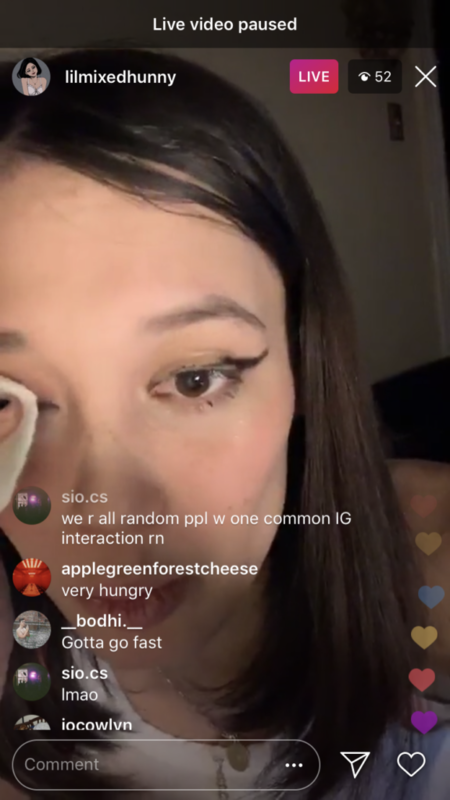 Tonight someone I follow on Instagram went Live because she was having trouble taking off one of her eyelashes and wanted advice. She sat there facing the camera/audience with one eyelash on and one eyelash off, reading comments and making jokes. She kept starting to remove the eyelash and then stopping, until someone said something about warm water, and someone said something about using a cotton round, so she ran around getting supplies and then finally, just as she was about to actually remove the eyelash, she paused the video. And then everyone in the comments started talking about what they were having for dinner, and whether they liked the new Billie Eilish. Without the original person to focus on everyone in the audience started interacting with each other. An instantaneous pivot into a lovely little community. This went on for a few minutes while we waited for the video to unpause, but it never did. It just ended, and the whole thing was suddenly over. All these little communities being born and quietly dying, like stars on the other side of the universe.